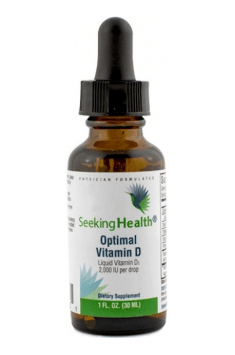 Vitamin D – what’s new in supplementation? Skin synthesis? It’s difficult in Poland! There are very few foods rich in vitamin D and they are not often eaten. Vitamin D is produced primarily in the skin, but only if you’re sunbathing with your arms and legs exposed, for a minimum of 15 minutes, between 10 and 15 hours, without the use of a protective cream with sunscreen. A hand up, which one of you sunbatches in this way in October, in Poland? This is basically impossible, right? And what’s only in November or December! That’s why vitamin D should be supplemented. In May 2018 new guidelines were published. On their basis I will show you how to check step by step what dose of vitamin D you need. Ask your doctor to determine the amount of vitamin D. This test is called 25 (OH) D. If the results indicate a deficiency, consult a physician who will propose the correct dose based on your situation (higher than the prophylactic dose). Each Pole is exposed to a deficiency of vitamin D, but individual groups have a higher risk of deficiency. The latest recommendations have identified risk groups. people suffering from celiac disease and inflammation of the intestines. This list does not cover all situations in which you will be classified as a risk group. If you’re not sure if you’re talking to her, talk to your doctor. use of maximum preventive doses (if the test result is in the norm). If you have a vitamin D deficiency confirmed by testing, the dosage of supplementation should always be determined by your doctor. If you have obtained the correct result in the test and you do not meet the conditions of sun exposure, you should supplement 800-2000 IU of vitamin D daily, every day, throughout the year. Attention! If you are at risk, choose the highest dose of preventive supplementation, i.e. 2,000 IU per day. If (by some miracle) you manage to meet the conditions of exposure to the sun, supplementation is not necessary, but it is still recommended!